This deck excels at winning quickly with a blitzkrieg of attacks from ＜Alien＞ cards. After aggressively reducing the opponent’s life total in the early game, use [BT1-011 Lightning-fast Hit]’s skill to close things out. 1.Attack with high-powered cards in the early game, particularly [BT1-014 Saiyan Cabba] and [BT1-017 Evolution Premonition Frost], whose skills are best used to attack the opponent’s Leader. 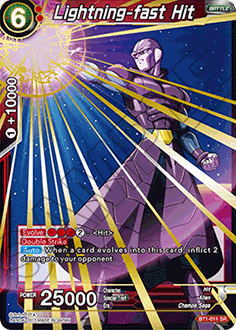 When a Battle Card with over 15000 power attacks a Leader, [BT1-001 Champa]’s skill kicks in, netting you a card to fuel your offense. 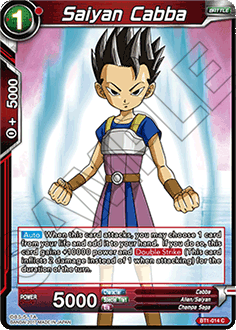 [BT1-014 Saiyan Cabba] adds a card from your life to your hand and gains 15000 power every time he attacks, and he has [Double Strike] to boot. He only costs one energy, making him easy to play, but his skill chips away at your life total, so be careful not to abuse it too much. 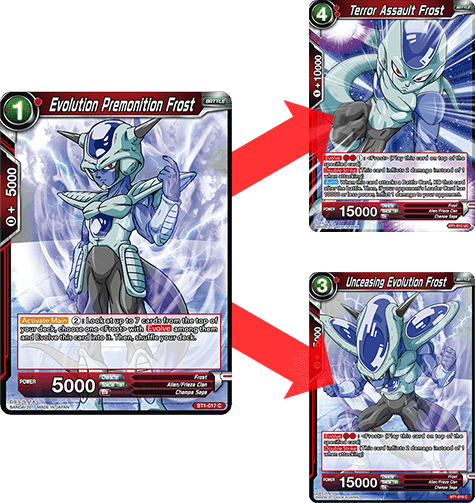 By spending two energy, Evolution Premonition Frost lets you look at the top seven cards of your deck, and evolve into any ＜Frost＞ card you find. By playing him turn one and using his skill turn two, you can quickly get a 15000-power Battle Card with [Double Strike] on the board. 2.Overwhelm your opponent with an unrelenting assault! 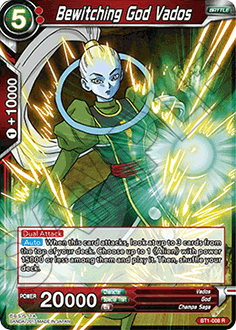 [BT1-008 Bewitching God Vados] can pull up an unending army of ＜Alien＞ cards to your ranks, providing just the onslaught you need to deal damage to the opponent’s life total. Once your opponent’s life total drops to two or below, evolve a card into [BT1-011 Lightning-Fast Hit] to close things out. 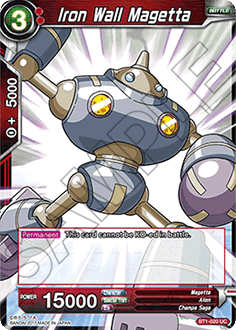 [BT1-008 Bewitching God Vados] lets you look at the top three cards of your deck and play an ＜Alien＞ card with 15000 power or below. She also has [Dual Attack],which means you can potentially play up to two cards this way per turn. Most of the ＜Alien＞ cards in the deck have 15000 power or below, so the odds of finding a playable card when you attack is in your favor. [BT1-011 Lightning-Fast Hit] deals two damage to the opponent’s life total when he evolves into play, no questions asked, which means you can win instantly if you evolve into him when your opponent is at two life or below. You have to evolve into him, however, which means you’ll want to play [BT1-012 Hit] during the early stages of the game. Normal Battle Cards go into Rest Mode after attacking, which makes it easier for them to get KO’d. [BT1-020 Iron Wall Magetta] can’t be KO’d, however, so you can attack with him every turn, worry-free. If you have three energy, play him. It’s essential to prevent your Battle Cards from being KO’d in order to keep up your offense. Play cards that are hard to KO and keep the attacks coming.